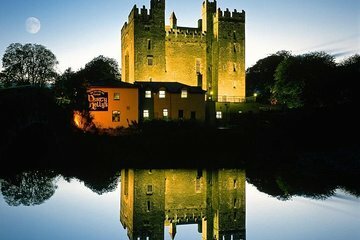 Step back to medieval and Victorian times with a full-day admission ticket to Bunratty Castle and Folk Park near Shannon Town. Explore the 15th-century castle to see its rich furnishings, chambers and artworks, and wander through the folk park, a recreation of a 19th-century Irish village brought to life with costumed animators. See the replica cottages, shops, farmhouses, and Bunratty Walled Garden, and learn about traditional village life over a century ago. Show your ticket at Bunratty Castle and Folk Park and head inside. The castle usually opens from 9:30am until 5:30pm, with last admission at 4pm. Double check the opening times before you visit. Once inside, your ticket lets you explore as you wish. Browse the castle, a restored 15th-century tower house. Walk around at leisure or join a castle tour for a deeper insight into the building. Admire the furnishings, tapestries, and artworks, most from the 15th and 16th centuries, and learn about the castle’s history from the information booklets. Afterward, stroll around the folk park, an enchanting recreation of a 19th-century Irish village, with reconstructed farmhouses, cottages, and shops set around a village street. See the school, doctor’s house, grocery, drapery, printers and other shops, all furnished as they would have been at the time, meet the costumed animators who bring the village to life, and visit the pub, which serves food and drinks (own expense). browsing the gift shop or relaxing in the traditional tea rooms. Your experience concludes when you leave the complex. This was not a guided tour, but a self-catering one. It afforded me the opportunity to go at my own pace, to look at what I wanted and to move along from things that I didn't. There was plenty to look at from the castle itself, several cottages, a Main Street, animals and shops. I would definitely recommend the Castle and Folk Park to other people who are traveling to Shannon.